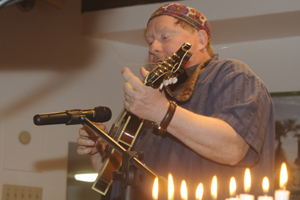 Rabbi Baruch Melman, Temple Israel, Stroudsburg, PA, took the lead as band frontman during the final service of the eight-day 2018 Chanukah season. 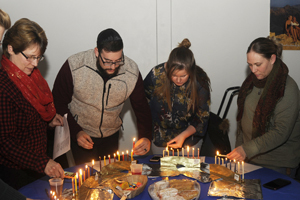 Chanukah is a Jewish celebration that commemorates the rededication of the Second Temple in Jerusalem during the second century B.C., where Jews rose up against their Greek-Syrian oppressors in the Maccabean Revolt. 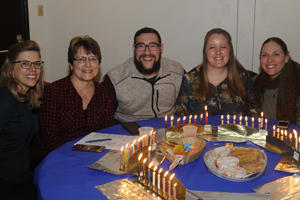 Members of Temple Israel, Stroudsburg, celebrated the final day of Chanukah with traditional blessings, fare, dancing and singing. 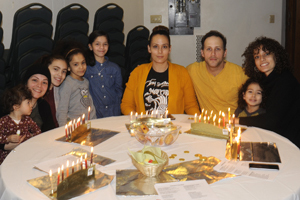 During Chanukah, celebrants light candles from left to right with the center candle known as the SHAMESH. 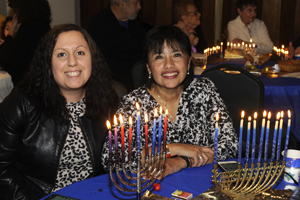 The party was time for family and friends to celebrate the holidays together. 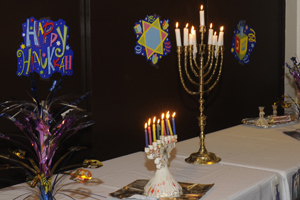 There were activities for adults and children.